Supercharged, lightweight and distilled from Lotus' extensive motorsport knowhow, the new model packs 243 hp into a chassis designed to deliver the benchmark in responsive handling and haptic feedback. The car's enhanced aerodynamics come from a number of additions including a new lightweight rear wing, front splitter, bargeboards and rear diffuser contributing to 125 kg of downforce at 140 mph. As the latest car to receive the Cup treatment, the new Lotus Elise Cup 250 bridges the gap between road and track to offer racecar capabilities in a package that can be used every day. 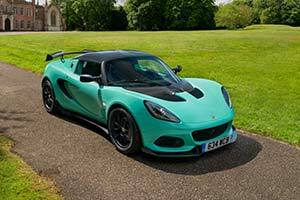 Focused on cutting weight and boosting performance, Lotus' development team has built on the significant updates introduced for the latest Elise, which has already been hailed as a five-star car by the international motoring press. Dry weight has been reduced to just 884 kg (or 860 kg with all lightweight options) and the adoption of advanced lightweight materials including carbon fibre, titanium and aluminium has helped to cut kilos from crucial areas leading to a 0-60 mph in 3.9 secs and a power to weight of 283 hp per tonne. The Elise Cup 250 carries the new visual identity, first introduced on the new Elise Sport and Sprint models. Changes to the body include a redesigned lightweight front clam panel with wider radiator apertures and mesh pattern grille, and a new design of rear transom panel featuring two light clusters, rather than four, visually enhancing the design. The Elise Cup 250 also includes a number of high-performance additions unique to this model. These include revised dampers and ultra-lightweight forged wheels with Yokohama Advan A048 LTS tyres - 225/45 ZR17 at the rear and 195/50 ZR16 at the front. Announcing the new car, Jean-Marc Gales, CEO, Group Lotus plc said, "The Elise Cup 250 is the latest edition in an exciting period for the company which has seen us launch a number of very special new cars across our entire range. We know what existing Lotus enthusiasts demand from our cars and we are also bringing in many new customers who can see clearly that we offer an unrivalled combination of performance, styling, dynamics and value for money. A Lotus rewards like no other car, with sharp handling, tremendous speed and a pure, undiluted driving experience. The power and aerodynamic prowess of the new Elise Cup 250 has taken the fight beyond the reach of lesser rivals and, at just 860 kg, it shows that we are ahead of the curve in delivering lightweight, intelligently engineered sports cars."